Americans work a lot. Work is life for a lot of people. If staying a 30 minutes extra means finishing one extra task, a lot of us will do it. But those half hours start to add up after awhile. In April, a CNNMoney work-life balance quiz found that more than half of the 7,500 people it surveyed said they feel pressure to work more than eight hours a day and some weekends, too. But research has found that anything more than a 40-hour work week actually makes us accomplish less. Daniel Cook, Chief Creative Officer at gaming company Spry Fox and a software engineer, created a graph to show what he calls the Rules of Productivity. 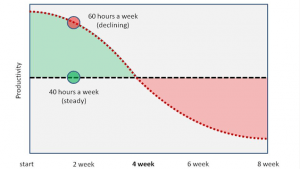 It shows that working 60 hours a week leads to a productivity slump that you actually have to recover from over time, according to Lifehacker. In a 60 hour crunch people have a vague sense that they are doing worse, but never think that they should stop crunching. They imagine that working 40 hours a week will decrease their productivity. In fact, it will let them rest and increase their productivity. This behavior is fascinating to observe. Zombies stumble over to their desk every morning. Temper flare. Bugs pour in. Yet to turn back would be a betrayal. Working more than 40 hours a week is often seen as normal or expected in certain occupations, like tech, engineering, and clerical work, to name a few. That’s why Sheryl Sandberg, Facebook COO, hid from most of the tech world the fact that she made it a point to leave the office everyday at 5:30 p.m. to be with her kids. The workaholics (and their profoundly misguided management) may think they’re accomplishing more than the less fanatical worker, but in every case that I’ve personally observed, the long hours result in work that must be scrapped or redone. What’s more, people who consistently work long work weeks get burned out and inevitably start having personal problems that get in the way of getting things done. All work and no play doesn’t just make Jack a dull boy—it makes Jack less likely to do the work right from the beginning. If you need any more convincing, the Centers for Disease Control and Prevention have cited studies that found “a pattern of deteriorating performance on psychophysiological tests as well as injuries while working long hours,” according to CNNMoney. So, please, please, keep yourself rested, indulge in your social life, and make yourself the best worker you can be by limited your work week to no more than 40 hours.